The GLP impression X4 Bar 10 and impression X4 Bar 20 are high performance battens offering flexibility to today¡¯s lighting designer across multiple applications. The GLP impression X4 Bar uses high output RGBW LED¡¯s that are packed tightly to give a full batten of light, with 20 LED¡¯s used in the 40¡È long X4 Bar 20 and 10 LED¡¯s used in the shorter 20¡È X4 Bar 10. High quality optics ensure a smooth, homogenized output across the batten through a broad pallet of pastel and saturated colors. This allows for subtle graduated fades, or for distinct color breaks between LED¡¯s. This is complimented by GLP¡¯s exceptional dimming which ensures that there is no color shift, just smooth even fades. DMX control offers full pixel mapping capabilities, allowing a whole multitude of dynamic fades and chases through intensities and colors. 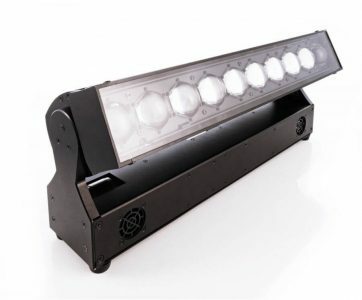 The X4 Bar 10 and X4 Bar 20 both feature a 7:1 zoom ranging from 7¡Æ to 50¡Æ, giving effects from a narrow angle light curtain to a wide angle backlight or washlight. The X4 Bar also features a motorized tilt, for fast refocusing or to be used to add more dynamics to the output beam. The X4 Bar has been specifically designed to give consistent pixel spacing between adjacent units, an important visual aspect for many designers using fixtures in view of the audience. The X4 Bar is complemented by Powercon in and thru connectors for easy daisy chaining without the need for an external PSU, multiple DMX modes, rubber feet for floor mounting and ¨ù turn attachments points for rigging flexibility.